OSX86 took almost a month to be completed. Failures over failures installing with Gainward GT640. Experimented with the old MSI 9500GT to install maverick on Z77 DS3H. Installation was smooth. 3D test was disappointing. Decided to but Gigabyte GT 640 card. Still with Graphics Card detection issue by the mobo. Read almost everywhere that most Gigabyte mobo had issues with PCIex16 cards. Some people set PEG to lower Gen2 or Gen1 to resolve BIOS boot issue. 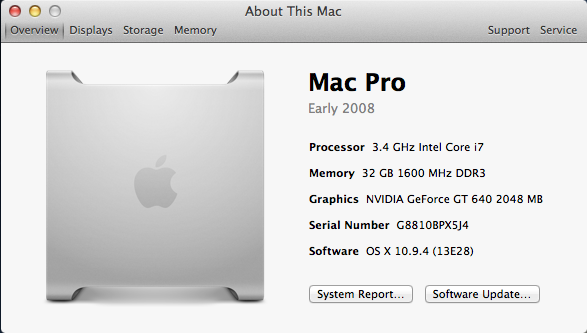 Set machine to Mac Pro 6,2 disabled the VGA in Mac OSX. Switched back to Mac 3,1 to continue using VGA.